Sitting in the office, waiting for the sun to finally poke through the month-long rain cloud that settled over Maine, I bust out the Gazetteer and search for a place to get wet and maybe go coastal kayaking. I grab some change for a Red Bull and Little Debbie for my trek and notice I have a Maine state quarter in the mix. 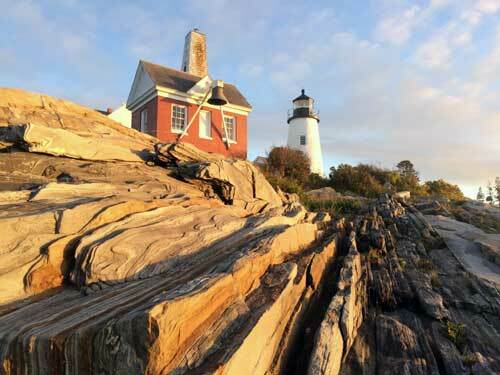 That gets me thinking – Pemaquid Point. What a beautiful place to be on the first sunny day in eons. 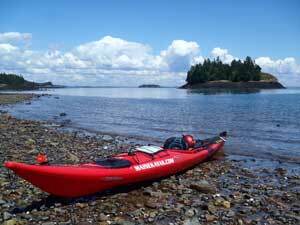 With coastal kayaking in mind, I look at Map 7 and see I have a choice between Muscongus Bay to the east of the point, and John’s Bay to the west. I flip that Maine state quarter and west it is: John’s Bay. I throw the boat on the roof and stop by Troy General to get that Red Bull and Little Debbie snack cake (they had my picture plastered all over the store for stealing diesel – a case of mistaken identity as I don’t even own a diesel vehicle but I digress). I hit the road and cruise through the quaint central Maine towns that you see in post cards – Liberty, Waldoboro, New Harbor. 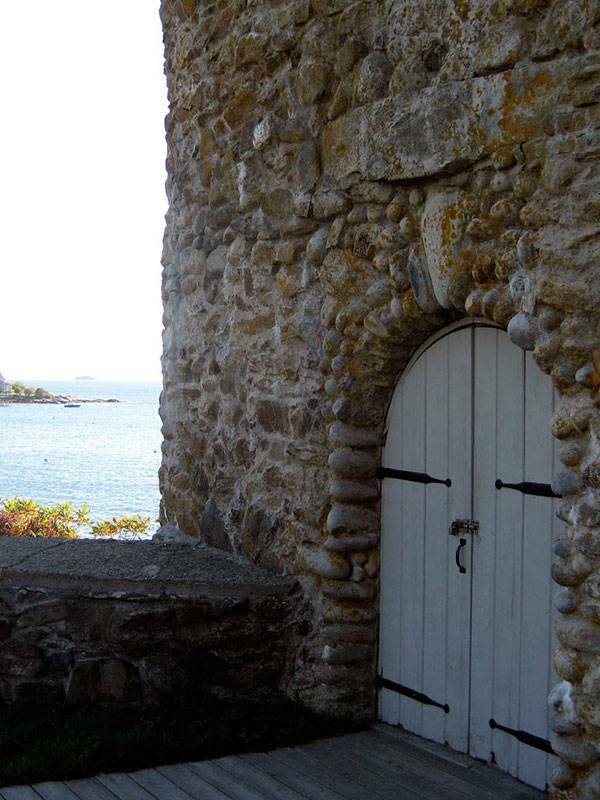 I arrive in New Harbor and drive to Colonial Pemaquid, home of Fort William Henry. 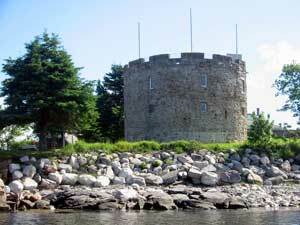 So, Fort William Henry is actually the third fort built at that site and was erected in 1692 to protect against invasion by the French. At the time that it was built, it was the largest and strongest fort in America (gotta love that Gazetteer). There is a boat launch at Colonial Pemaquid and I get my affairs in order and get on the water. I put on the water with threatening clouds all around (so much for that first sunny day of summer) and the rain has just begun to splash against the sea. Knowing the weather was working against me, my intention was to stay close to shore. I start paddling north up the Pemaquid River on the fourth hour of the outgoing tide. The further north up the channel I paddled, the more sunny and light it became. I could see this amazing sucker hole developing above me and was thankful from the core of my being that I was going to get my first nice day on the water. As I approach the mud flats high in the upper cove, I notice a lonely, solitary osprey perched up in a tree to the west. Within a few minutes, I notice another and another and another. Suddenly, it occurs to me that the ospreys are following something. Although I have that Little Debbie wrapper in my life jacket pocket, I have to assume they weren’t following me. I decide that I’d rather watch the show than be a part of it and I decide to hang back and let nature dance in front of me without disturbing the show. I stop paddling and lay back against the deck of my kayak, camera in hand. The ospreys are getting more and more frantic and frenzied about whatever it is they are after. I can’t see the fish below the surface and I didn’t want to get too close, but you could see that the ospreys were following their lunch as the fish schooled further and further up the river into the shallows. I’m taking these incredible photographs of seabirds, on the cusp of the sucker hole that I’ve been lucky enough to paddle in most of the day. As I’m laying on the back deck of the kayak, contemplating my desire to get better shots versus my leave no trace ethic, marveling at the splendor of nature that is ospreys feeding on schools of pollock, a very strange sight comes into view. A B-10 bomber or some other such military plane barely skims 100 feet above tree line and into my view of the sky from my prone position. That brief disturbance certainly irritated the ospreys but their hunger seemed to snap them back out of it fairly quickly. As I sat there contemplating the adaptable nature of birds, I noticed one particularly large osprey out of the corner of my eye that had flown in and perched in a large tree. I turn to check out this incredible bird when it occurs to me that it is not an osprey but a bald eagle. Although the ospreys had been previously consumed by the feeding frenzy and barely noticed the obscenely large military plane that had disrupted their supper, they certainly took notice of the eagle and scattered to the wind. As with the ospreys, my sucker hole was also scattering to the wind and I took that as my final cue to head out and leave on a very high note. 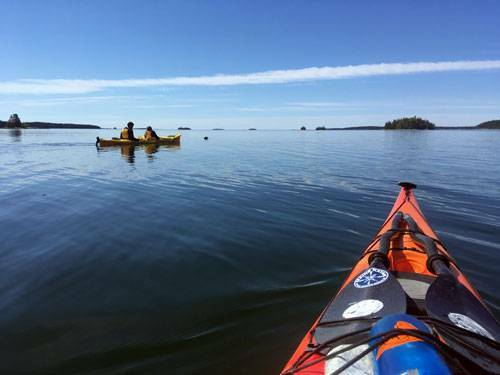 So, if you are looking for a trip to get your sea legs back, to get some fresh air, to enjoy a serene paddle, to commune with nature, I highly recommend John’s Bay. But, keep these things in mind: 1) go on a good day, there is so much more to see than I was able to that day, 2) be conscientious of your surroundings, nature will reward your discretion, and 3) although Little Debbie’s are great on the water, the ultimate end to a great paddling day is a piece of Moody’s pie and a cup of joe. Alvah Maloney is a 10-year whitewater paddler and 6 -year sea kayak guide. He is founder and president of Maine Kayak, a company that offers whitewater instruction for all skill levels and lake touring and sea kayaking trips in Maine. Contact him at Maine Kayak or 1-866-Maine Kayak.